Just returned from the beautiful Caribbean island of Nevis. There on 23rd March 1971 Norman Fowler was found dead in what may have been mysterious circumstances. Fowler was Peter Watson’s last boyfriend, his main heir and the only person present in Watson’s flat when he drowned in his bath in his Rutland Gate flat in 1956. After that Fowler vanished to the West Indies, basing himself mainly in the BVI, where he pursued various harebrained schemes and found many varied ways of frittering away Watson’s money (including entering into a property deal with Ken Bates). 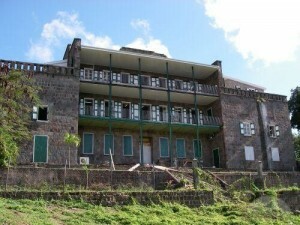 Late in the 1960’s he moved on to Nevis, buying a prestigious but run down local landmark called the Old Bath Hotel. And there he too was apparently found drowned, in an uncanny repeat of Watson’s death. The attraction of the old hotel, one of the oldest in the Caribbean, was that it had in a special bath house in the grounds hot spring water available for bathing, although any longer than a short period risked the bather’s health. So it is quite possible that Fowler, aged about 44, simply stayed in the hot water too long and expired. By the time he died it is thought that he had sold the vast majority of Watson’s amazing art collection. More detail in the book…. A extended version of this article, under the title ‘Who was Norman Fowler?’, appeared on April 12th 2013, in the local St Kitts and Nevis newspaper, SKN Choice Times. This included some additional biographical detail on Fowler.